Whatever you call it, we have it. 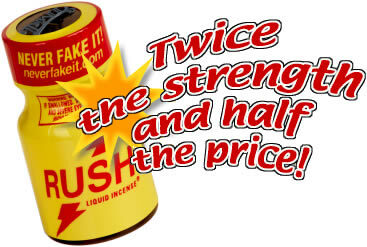 Choose from a great selection of potent, pure poppers at unbeatable prices! We are Power Poppers, Europe's #1 poppers supplier. Because when it comes to poppers, it really is all about power. And at Power Poppers, we make sure there is a lot of power packed into each bottle we sell. For example, our Rush and Hardware are the real export-strength formulas (yes, there is a difference!). Our Jungle Juice is genuine amyl nitrite. And Rave poppers? Well, just try for yourself and see if that's the one to rave about! We only carry the world's purest, most potent aromas -- you will find no off-brands or low-quality imitations here. We work closely with all the major poppers manufacturers and hand-pick the best there is. We thoroughly try & test each product to make sure it delivers the quality we have become so renowned for. We will never sell a brand we are not completely confident about. At Power Poppers, we also believe that quality does not need to come at a premium. We have always been completely committed to providing superior products for less than you would pay elsewhere. Buy one bottle each of Amsterdam, Blue Boy and Manscent and get a bottle of Reds poppers for FREE.